Because GroveCity2050 is intended to be a Community Plan, in addition to studies and analyses, input was sought from residents, festival-attendees, business owners and members of community organizations throughout the process. Before any planning or analyses were conducted, a 30-member steering committee was created to guide the GroveCity2050 process and help shape the plan’s recommendations. This group was formed through a public application process which resulted in nearly 100 applications, and members were selected to be representative of Grove City’s diverse interests and population. The committee acted as spokespersons for the planning effort, officially represented citizens in the planning process and provided feedback to the planning team. Additionally, two working groups were created from applicants not selected for the steering committee. These groups discussed specific issues related to land use, transportation and economic development and were key in the formulation of recommendations contained in the plan. Workshops, Open Houses and Online Input – A community workshop was held early in the planning process to gather public ideas and insight on planning for the community’s future. Over 230 people contributed ideas either in person or online. Feedback was also gathered online through Facebook, the City’s website and the GroveCity2050 website. Once the preliminary goals, objectives and other recommendations had been drafted, another public open house was held to allow the public to review and evaluate the draft recommendations. Members of the public were asked to provide written comments of support or concern and had the opportunity to speak one-on-one with staff and members of the planning team. 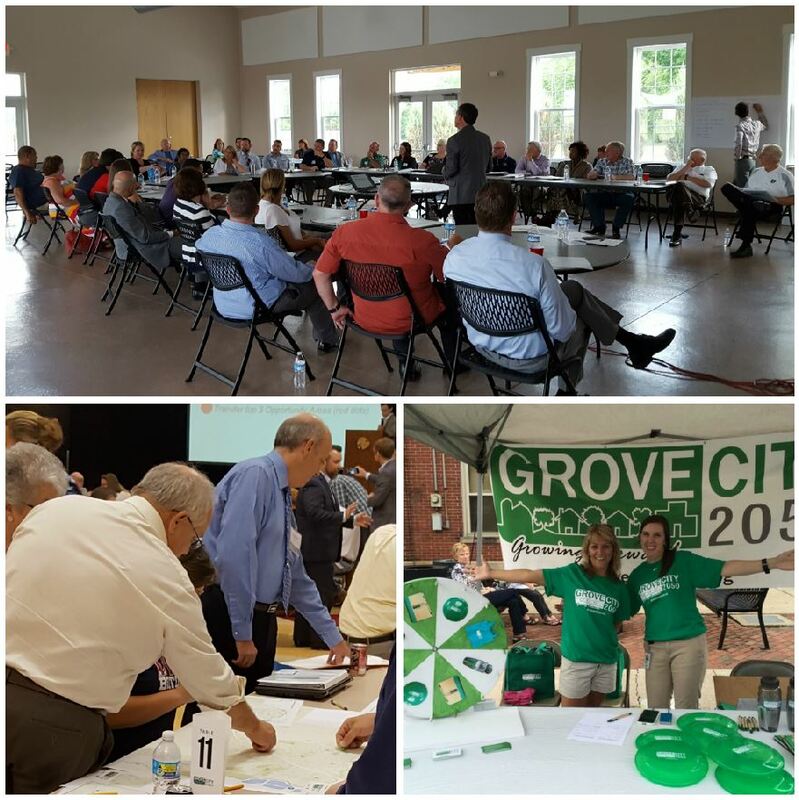 Events – Members of the steering committee, working groups and city staff were present at a number of community events to gain input from the public and raise awareness of the GroveCity2050 initiative. Stakeholder Meetings – Meetings and interviews were conducted with stakeholder groups including regional planning groups such as the Mid-Ohio Regional Planning Commission (MORPC), the Central Ohio Transit Authority (COTA) and Columbus2020, elected officials, county planning officials and South-Western City Schools. Business Surveys and Focus Groups – An online survey was conducted of businesses in Grove City to collect information including why businesses chose to locate in Grove City, the advantages and disadvantages of Grove City as the location of their business and issues that businesses felt the City should address. Focus group meetings were also held with local businesses to allow for a more detailed discussion and understanding of challenges facing local businesses. Updating the community plan included analyzing existing conditions in land use, infrastructure, development capacity, transportation conditions and economic opportunities. It also involved a review of the City’s existing plans and policies as well as those of other area jurisdictions. Analyses also involved leveraging MORPC’s insight2050 to examine regional trends and how planning efforts can impact a variety of metrics such as land consumption, vehicles, miles traveled and local fiscal impacts. Based on these analyses, a focused growth approach was recommended to allow for more infill and redevelopment by identifying ways the community can evolve to meet the needs of our future population while maintaining the best aspects of Grove City’s character.